Hey everyone, I hope you had an amazing and restful weekend and that you are ready to begin another amazing week. I would like to invite you all to please post a comment or two on the Have Fun Teaching Blog. This will help me know who I am communicating with and I can start to become a little more personal with you as a community. Just click the "comments" button at the bottom of each individual post. Thank you so much! 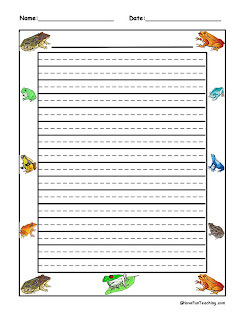 Hopefully you enjoyed the free handwriting practice worksheets the other day. So, now that you have worked on your handwriting...it's time to stretch those hand muscles and begin writing sentences, paragraphs, stories, and essays! My name is Jill and I am a second grade teacher in Fort Wayne, Indiana. I've stumbled across your site through google. I was looking for butterfly writing paper! I found some! Thank you for your links! I bookmarked your pages and will be coming back to see what else you post! Thank you so much for posting Jill! I am glad that you could use the Butterfly writing pages!